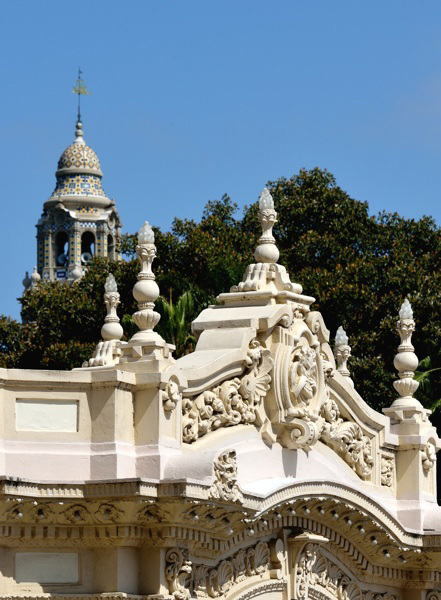 Monday, June 25 through Monday, Sept. 3, 2018, The Spreckels Organ Society lights up San Diego summer nights with the International Summer Organ Festival ­– an inspiring lineup of free outdoor concerts at the Spreckels Organ Pavilion in Balboa Park, each designed to demonstrate the fresh sound of the historic 1914 Spreckels Organ, the largest outdoor pipe organ in the world. The 2018 Festival features virtuoso performances by world-class organists, music for Independence Day, acclaimed string and organ duos, Rising Stars Night with 15 year-old twin organists, the always popular Spreckels Silent Movie Night, and Rocking Balboa: A Pink Floyd and Led Zeppelin Tribute. All Festival concerts start at 7:30 p.m., are free to the public, and are open to all ages. Friendly music-loving pets on leash are welcome. Light snacks, beverages, and unique gifts are available on the pavilion grounds, and proceeds from donations benefit the nonprofit Spreckels Organ Society, which works to preserve, program and promote the Spreckels Organ as a world treasure for all people. Monday, June 25, 7:30 p.m. ­– Opening Night of the 31st Annual International Summer Organ Festival features Raúl Prieto Ramírez, new Civic Organist of the City of San Diego. With words such as “sizzling” and “transcendent” used to describe his performances, Raúl Prieto Ramírez is the first Spanish organist in recent times to establish himself among the elite of the international pipe organ scene. His powerful personality, passionate expressiveness, and outstanding technique make him shine in a wide range of repertoire and styles. Monday, July 2, 7:30 p.m. – Award-winning American theatre organist Walt Strony performs an evening of patriotic music celebrating Independence Day. Strony is one of America’s premier concert organists. He made his public debut in 1974 at the age of 18 and has since established himself as one of few organists equally at home playing both theatre and classical organ. Monday, July 9, 7:30 p.m. – At just 24 years old, Alessandro Pittorino is increasingly becoming one of New York City’s most exciting, invigorating, and innovative young organists. Hailing from Australia, he recently received his masters degree from The Julliard School. Monday, July 16, 7:30 p.m. – The spell-binding performances of concert organist Adam J. Brakel have led to his being compared to Liszt, Gould, Bernstein, and Paganini — suggesting that true musical prodigies continue to exist in the 21st century. National Public Radio in Florida hailed him as “An absolute organ prodigy, with the technique and virtuosity that most concert pianists could only dream of, and having the potential to be the leading organist of his generation. Monday, July 23, 7:30 p.m. – Hailed as “A world-class virtuoso” and “an expert at defining darks, lights, shadows and colors,” Bradley Hunter Welch is increasingly in demand as a recitalist, concerto soloist, and collaborative artist. A native of Knoxville, TN, Bradley holds the Doctor of Musical Arts, Master of Musical Arts, Master of Music degrees, and the Artist Diploma from Yale University. Monday, July 30, 7:30 p.m. – An evening of Violoncello and Organ. Acclaimed organist, Chelsea Chen, and New York City Ballet Orchestra cellist, Joseph Lee bring their unique artistry to a concert of cello and organ music. One of the most celebrated organists of her generation, Chelsea Chen has electrified audiences throughout the world. Joseph Lee, is a beloved member of the New York City Ballet Orchestra and currently teaches at the Geneva Conservatory in Manhattan. Both Ms. Chen and Mr. Lee earned degrees at Juilliard School in NYC. Monday, August 6, 7:30 p.m. – An evening of violin and organ. Organist Ken Cowan and his wife, Lisa Shihoten, combine forces for an exciting program of virtuoso works for organ and violin. Ken Cowan is one of North America’s finest concert organists, praised for his dazzling artistry, impeccable technique, and imaginative programming by audiences and critics alike. Juilliard-trained Violinist Lisa Shihoten made her debut with the Juilliard Orchestra conducted by Kurt Masur at Lincoln Center. She enjoys an active career as a chamber musician, recitalist, and teacher. Monday, August 13, 7:30 p.m. – The Festival’s annual Rising Stars Night features 15 year old, twin brothers Reilly Xu and Bruce Xu. Reilly is currently studying in The Juilliard School’s Pre-College program, and Bruce is a rising junior at the high school program of University of North Carolina School of the Arts. Monday, August 20, 7:30 p.m. – Silent Movie Night! Theatre Organist Steven Ball returns to San Diego for the Festival’s popular Silent Movie Night. He’ll play for the hilarious Safety Last (1923) starring Harold Lloyd, a film that includes one of the most famous images from the silent film era: Harold Lloyd in a straw hat and round horn-rim glasses, hanging from the minute hand of a clock on a skyscraper 12 stories above moving traffic. Steven Ball occupies a rather unique place in the musical world of the organ. Widely recognized for his scholarship both with classical improvisation as well as the art of silent film composition and accompaniment, he has travelled and performed world-wide. Monday, August 27, 7:30 p.m. – San Diego Civic Organist Raúl Prieto Ramírez and his wife Maria Teresa Sierra have been performing full-scale concert performances for piano and organ since 2007. The high artistic standards and blazing, edge-of-the-seat virtuosity which mark their individual performances permit them, as a duo, to approach the music with the precision and clarity of a premier chamber ensemble. As Le Monde (Spain) described: “They play as with one mind.” Maria Teresa Sierra is a noted concert pianist who trained at the Rimsky-Korsakov Conservatory in St. Petersburg, Russia. Monday, September 3, 7:30 p.m. – Rocking Balboa: A Pink Floyd and Led Zeppelin Tribute. The finale of the International Summer Organ Festival features San Diego Civic Organist Raúl Prieto Ramírez playing classics by Pink Floyd and Led Zeppelin, two of the most influential rock bands in music history.